Culinary is the art of cooking. No matter where you live or what you do, food is a necessity that reflects our taste, tradition, and culture. The food industry has grown in recent years as more people are incorporating “eating out” in their daily routines. According to the National Restaurant Association, more Americans are adopting healthier lifestyles and concepts, pushing the demand for culinary artists that can meet the requirements. Television shows such as “Masterchef USA” have added to the popularity of culinary careers. Many assume that becoming a culinary chef requires no formal training. In today’s highly advanced economy where consumer tastes are constantly evolving, chefs must be skilled and educated. 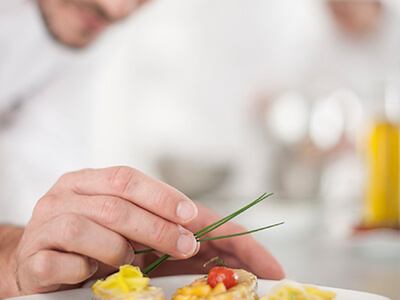 The field of culinary arts is not just limited to cooking, but includes a variety of other sub-categories such as food management, beverage management, hospitality, restaurant management, and more. The booming food industry offers diverse career paths to individuals interested in culinary arts. This program is geared towards providing students with in-depth knowledge of the culinary field. Students develop diverse cooking skills and also broaden their theoretical understanding of food science. Alongside developing a solid foundation of general education, the program will emphasize advanced core subjects. Students will learn how modern-day food businesses are run, what factors influence food cultures, and how food is marketed through various mediums. This is a two-year graduate program that emphasizes on advanced culinary skill development. The program is intended for students who are already working in the culinary industry, have already earned a bachelor degree in the same or relevant field, and wish to broaden their career opportunities. A master’s degree may also include an externship as a part of the curriculum. This is a supervised work experience that helps students acquire work knowledge, skill, and professional exposure. To successfully complete each degree, you must earn a minimum number of credit hours, complete all assignments, and pass certain examinations. Online learning has gradually gained popularity all across the globe. If pursuing culinary arts is your goal, but you can’t afford college or do not have the time for classes, you can still achieve your goal with the help of an online culinary arts degree. The online mode of learning can prove to be more flexible and convenient for working professionals. The coursework can be completed through online videos and lectures. Apart from flexibility, an online culinary degree could be more cost-effective as well. To expand your job opportunities and income potential, you could earn professional certifications as well. The field of culinary arts is expected to grow steadily in the coming years. This career path is suitable for you if you enjoy cooking and want to transform your passion into a career.